Robert LaPrade, MD, PhD of The Steadman Clinic in Vail, Colorado received the most prestigious honor given by the University of Maine Alumni Association. This award is based on a lifetime of professional achievement. "I am grateful to have had a number of influential professors at the University of Maine who taught me to work hard. I attribute a great deal of my success to their mentorship and influence," said Dr. LaPrade. On October 24, 2015, Top Orthopedic Knee Surgeon in the US Robert LaPrade, MD, PhD was awarded the University of Maine Alumni Association’s 2015 Career Award. The most prestigious award given by the University, this honor is based on a lifetime of professional achievement. Previous recipients of this award include Author Stephen King, Admiral Gregory Johnson (retired), and Senator Olympia Snowe. 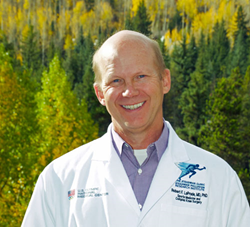 As a complex knee specialist at The Steadman Clinic in Vail, Colorado and Director of Biomechanics Research at the Steadman Philippon Research Institute, Dr. Robert LaPrade has dedicated his career to orthopedic research and innovation. Having published over 240 peer-reviewed articles, Dr. LaPrade is one of the most prolific researchers in sports medicine. He has received many awards for his research, including the OREF Clinical Research Award that is considered a Nobel Prize of Orthopedics. Many of the anatomic-based knee reconstruction procedures used around the world have been developed and tested through Dr. LaPrade’s research. "Dr. LaPrade has changed the way all Orthopaedic surgeons think about and treat knee injuries. He is one of the top Orthopaedic surgeons, researchers, and educators in orthopaedics," said Scott C. Faucett MD, MS, Orthopedic Surgeon at George Washington University. Dr. LaPrade graduated from the University of Maine in 1981 with his Bachelor of Science Degree in Forest Engineering. “It is both humbling and an honor to have been given this award. I am grateful to have had a number of influential professors at the University of Maine who taught me to work hard. I attribute a great deal of my success to their mentorship and influence. It has served as a foundation for my own career as a physician scientist,” said Dr. LaPrade. The award ceremony was held at the University of Maine’s Buchanan Alumni House. Attendees included the University’s President, Susan Hunter, and other Alumni Association leaders. In addition to the ceremony, the 2015 honorees were introduced at the Black Bears football game at halftime. As one of the top orthopedic surgeons in the US, Dr. LaPrade is recognized as an innovator in orthopedic care. Dr. LaPrade specializes in the diagnosis and treatment of injuries to the posterolateral knee (PLC), PCL, revision ACL reconstructions, meniscal transplants and all complex knee injuries. Whether it is a new injury, or failed treatment, Dr. LaPrade has excellent outcomes for returning athletes of all levels back to full participation.